Patricia Piccinini’s The Stags is currently on view in NMWA’s summer exhibition Super Natural. 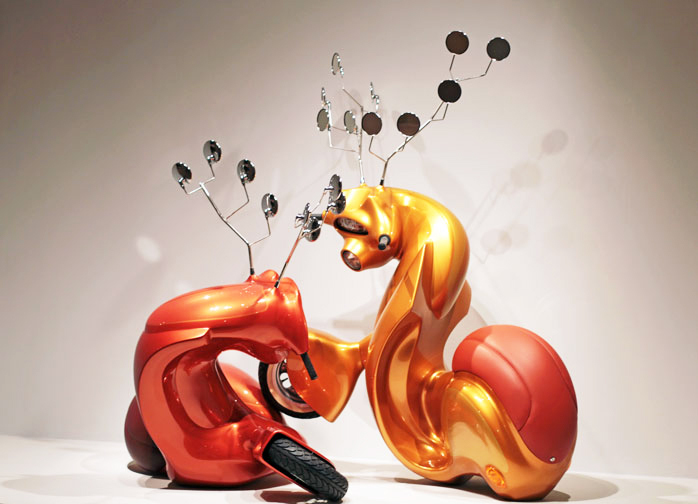 In sleek and shimmering fiberglass, the two large sculptural pieces of The Stags combine characteristics of Vespas and fighting deer. Although Piccinini has created other works with auto-inspired elements, many of the Australian artist’s works depart from this style. Piccinini’s other sculptures typically use silicon and hair to create humanoid creatures with convincingly realistic bodies. Together, these two distinct styles tell the story of mankind’s evolving scientific creations in both the “biosphere” and the “autosphere.” These different mediums both allow Piccinini to explore the complex intersection of natural and artificial elements—evoking wonder as well as fear at their possibly detrimental consequences. Piccinini’s automotive aesthetic incorporates biomorphic curves, contours, and dips to construct animal-automobile hybrids. She constructs creatures ranging from stags to Cyclepups and Truck Babies—what she imagines baby Vespas or semi-trucks would look like if vehicles could reproduce. Because these objects seem cute and harmless, the viewer doesn’t associate them with the negative characteristics of automobiles, inherent in industry and pollution. In a quickly advancing scientific world, technology becomes more sentient and advanced. Piccinini’s art cautions against unbridled enthusiasm for technological innovation, while also reveling in the wonders of nature. Her humanoid sculptures also explore the consequences of progress—this time in the field of genetic manipulation. Sculptures like Big Mother and The Young Family convey what future scientists could create by combining human and animal genes. Because of their exceptionally realistic and somewhat human appearance, these sculptures elicit emotional responses. The backstories of these works are full of trauma and confusion. 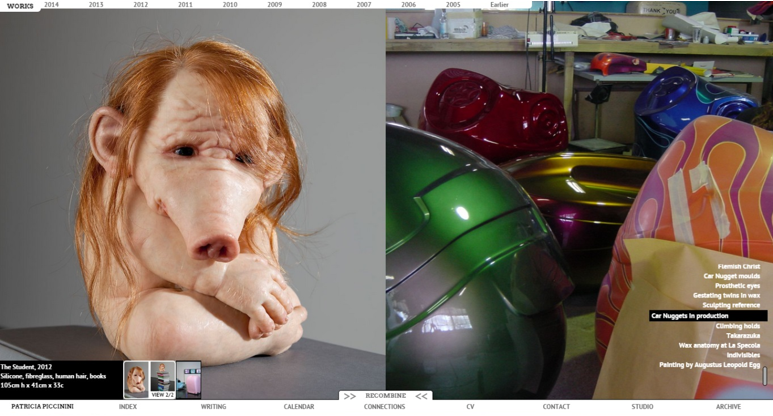 Piccinini ponders where these fabricated sentient creatures would fit into the world if they became realities. She doubts that society’s ability to accept new and different creatures could keep pace with science’s ability to create them. Piccinini’s art explores boundaries between the realms of human and machine as well as human and animal. She emphasizes the rapid evolution of technologically and genetically modified “things.” Are humans able to coexist and accept creations as creatures? Does society have enough foresight into the possible consequences of introducing hybrids? The questions Piccinini raises are acutely applicable to today’s world. She posits these questions with her technological and biological work, leaving the answers open to uncertainty and contemplation.